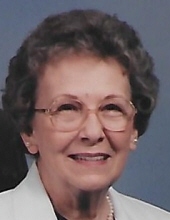 Betty Ann Johnson, age 90, passed away Sunday, October 7, 2018, following a long illness. She was born July 10, 1928, in Webb City, Missouri, to Clyde and Georgia Elliot. Betty graduated from Webb City High School in 1946 and attended Joplin Junior College. She received a Bachelor of Science in Education degree with the first graduating class of Missouri Southern State University in 1969. For 19 years, Betty taught third grade at Eugene Field School in Webb City, retiring in 1988. She was a long-time member of the First United Methodist Church of Joplin, where she was a member of the library staff, the Sarah Circle and a Sunday School and Vacation Bible School teacher. She was preceded in death by her husband of 55 years, Harry Johnson, who passed away March 11, 2007. Survivors include her daughter and son-in-law, Celia and Grant Mitchell; grandson, Philip Mitchell, and wife, Amanda; and great-granddaughter, Katherine Mitchell, all of Joplin, Missouri; granddaughter, Meredith Reed, and husband, Will, of Dodd City, Texas; nephew, Dr. David Bogner, and wife, Connie, of Nixa, Missouri; and two nieces, Carole Darby of St. Simon Island, Georgia, and Suzanne Medcalf and husband, Merle, of Harrah, Oklahoma. Services will be held at 11:00 a.m. Thursday, October 11, 2018, at the First United Methodist Church of Joplin with Marsha West-Eichler officiating. The will family will receive friends for visitation at the church following the service. Memorial contributions are welcome to the First United Methodist Church of Joplin in care of the mortuary. Arrangements are under the personal care and direction of Thornhill-Dillon Mortuary, Joplin, Missouri.